Summary: Each page shows a different worker and describes in rhyming text what his or her hands do; turn the page to see who that person is. The answers get a little more difficult through the book, starting with farmers and cooks and moving up to architects and physicians (which may not be a word preschoolers are as familiar with as doctors). The book ends by asking the reader what your hands could do; the last four pages give thumbnail profiles of all the professions illustrated. 32 pages; ages 4-7. 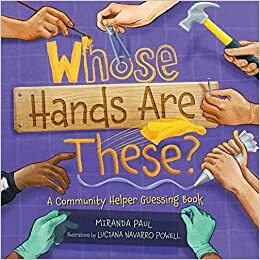 Pros: Having done a unit on community helpers, I know there aren’t a lot of good picture books that introduce many different kinds of jobs. This one is particularly fun and interactive with bright, interesting illustrations. Cons: Those of us who hail from northern New Jersey do not believe that “water” rhymes with “potter”.